So, combining glitters seems to be my thing right now and I can't stop, guys. I CAN'T STOP! The good news is that I don't really want to, so it all works out. Haha! 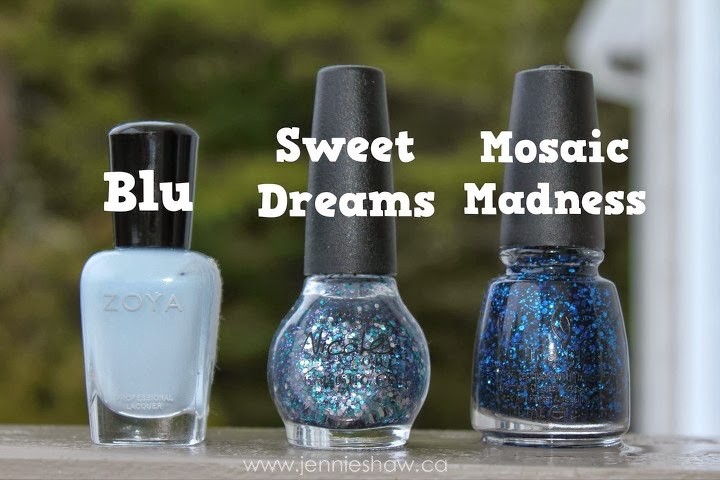 Two coats of Blu and then, using a flat nail brush, I added Sweet Dreams to just over halfway down my nail. Then, when it was dry, I used the same flat brush to add a coat of Mosaic Madness to the top third. Although I haven't seen the movie Frozen, I've watched Kristen Bell (who I LOVE) promote the movie all over the place and that's almost the same thing, right? Haha!! Anyway, this mani is my tribute to the movie (mostly Kristen Bell, ha). Blu has a soft spot in my heart, I think because it reminds me of my grad school UNC-Chapel Hill colors :-) Good luck with your move! My co-worker saw Frozen and said it was the most wonderful movie... so now I want to see it! Love the nails! OH I LOVE THESE!!! I haven't seen Frozen yet either, but I've heard really great things. Plus--I am obsessed with Kirstin Bell. Loving how nice these are for winter too! Kristen Bell rocks! Now that I know she is a voice in Frozen, I must see it. (I was SUCH a Veronica Mars fan, back in the day....I'm even in the graduation episode!). Love this one, the glitter looks go good on the Blu! I really want to see the movie it looks funny! That reindeer dragging his behind across the snow like a dog...too funny! Lovely colors. I keep forgetting to mention to you that when I look at the date up top, that I think it's June 12, 2013. We read the date different here. So it would be 12/6/13. Also that little video of Danielle on the side always makes me laugh. Frozen was good. It was awkward (very!) but entertaining! The visuals especially were beautiful. I heard over and over that it was as good as Tangled and now that I've seen it, I think people are nuts. It is nooo where near Tangled. But it's still good! Love how this turned out! I've got to try and layer glitter polishes like that...hadn't tried it yet! I love your nails! Your designs to cute as well. Each week your nails are so pretty. Thanks for hosting the link up and have a good evening.